My journey at IIIT-Delhi started back in July 2010. To put things in perspective, that was the year when Steve Jobs introduced iPhone 4 and the first ever iPad. Game of Thrones was a TV series unheard of. Sachin Tendulkar scored the first ever double hundred in a one day cricket match. Barack Obama had just completed 1 year as the president of the United States. And Tinder and Instagram did not exist. The past seven years have taught me more about myself than I could ever expect to learn probably during the rest of my life. I learned what I want to do in life. More importantly, I learned what I do NOT want to do in life. The credit for that goes collectively to the institute (IIIT-Delhi), the group (Precog), the advisor (PK), and the process (PhD). This can seem to be a long blog so I’ve tried to break it down into sections. The review read, “He is a smart student, but definitely has not picked up how to do research. He needs to really pick up some concrete questions and contribute with research work by end of the semester, otherwise, it is going to be tough to continue.” The illusion of success had been busted wide open. My association with IIIT-Delhi started in July 2010 when I joined as a Masters student. Too many people have talked about the cultural “shock” (in the positive sense) that they witness when they first come to IIITD. My case was no different, so I’ll skip that part. Moving on to the academics, life seemed pretty simple in the beginning. Putting in effort was translating to output and good results. One semester went by, and then another. A glowing grade card, a fellowship and an internship with IBM, and an amazing bunch of friends made life seem pretty much perfect. It was around this time [August of 2011] that I (and a few others from my batch) got an email from Prof. Pankaj Jalote, offering direct admission into the PhD program. I knew this was big, but at that point in time, I didn’t realise the magnitude of the impact that this decision [of enrolling into a PhD program] could have on my life and career. So I let my instinctive, opportunistic self drive this decision and without too much thought, I signed up within 3 days of getting the offer. Note: This is probably not the best way to make such a big decision. I consider myself unbelievably lucky to have been able to pull this off with such an approach. One important factor that pushed me in favour of taking up PhD was the individual I would be working with, the advisor. In retrospect, I think it was the excitement of working with PK more than anything else that tipped me into making the decision. Having accepted the PhD offer, the plan was to wrap up all requirements for the Masters degree and officially join as a PhD candidate only during the second half of 2012. But something else was in store. Right around the time the PhD offer came in, PK had connected me with Dr. Maura Conway from Dublin City University regarding a research project which was part of the seventh Framework Program (a.k.a. FP7) for research in Europe. Things started moving along at a decent pace and we made some progress in the next 4 months or so. Now the thing with projects like FP7 is that they come along with their perks. January of 2012. PK sat me down and said that I’d need to travel to Ireland for around 3 months as part of the project. This is where the “honeymoon period” starts. My starting date as a PhD candidate was moved up and I officially started PhD on February 4, 2012 (it made more sense to travel as a PhD student instead of a Masters student). I was already starting to realise the differences between being a Masters student and a PhD student. I had “levelled up” in life. I had my own desk for the first time in my life. Friends and family had started looking at me differently. There was a certain sense of respect I could feel. Cheap thrills! Anyhow, a trip to Dublin was waiting. The semester ended and I was off. May 3, 2012. My first international travel. Fully funded. And I had a ball. Read all about it in another blog I wrote. I’d like to think that the 11 weeks I spent at DCU were fairly fruitful. We got a paper submitted at a conference, I completed my Masters requirements, the exposure of an international collaboration helped me understand how the outside world functions, and the amount of fun I had was absolutely amazing. By the time I came back [July 2012], I was already part of another collaboration with Tiago and Prof. Virgilio from UFMG, Brazil. Another international collaboration with some big names, some ground work was already set up and that made life easier. Tiago and I started working on uTrack, incremented the work and submitted it to WWW, which is possibly the largest and biggest conferences in the Internet domain. Amazingly enough, it went through. Now getting this kind of success [paper at the main track of the world’s biggest conference] at such an early stage in PhD makes you feel like the James Bond of research. You tend to get the feeling that this journey is going to be a piece of cake and you’ll ace it every step of the way. And that is NOT good news. uTrack was followed by MultiOSN, my first independent project, which was featured in national level news and media during mid 2013. I was enjoying my work. The lab was practically a second home. The year ended with an opportunity to work with Symantec Research Labs for 6 months, which I gleefully accepted. To summarise this phase of life, I had two successful international collaborations, a project that had made national news, and an association with one of the world’s biggest and most popular brands in computer and web security. This was stuff that would make a glittering CV. All these events put me on my high horse and created the illusion of grand success at the PhD level. And this was building on top of the glorified GPA I had during my Masters degree. It was almost as if I couldn’t put a foot wrong. Little did I know that the real journey of PhD hadn’t even begun. Before I went to Pune for my 6-month long internship with Symantec in December 2013, PK clearly underlined that I “needed” to have a concrete problem defined for my PhD thesis before / by the time I came back. I agreed. Everything I had done up until this point, wasn’t really building up to a thesis. They were small independent projects, which might have come out well individually, but weren’t really building up towards a solving a clear-cut PhD problem. PK always talked about an input vs. output graph and said that most of us fall in the high-input-medium-output zone or probably even high-input-low-output-zone. Up until now, I didn’t really agree with him. The first part of my PhD life seemed to lie kind of like in the medium-input-high-output zone. But this was the phase where I realised what PK really meant. December 2013 to May 2014 was high input time for me. In addition to the project I was working on with Symantec, I was also working towards building a concrete problem for my thesis. I used to start my days at around 10 am, go to office, work, come back at 7-8 in the evening, sat down again at around midnight and worked until 3-4 am. Pretty much high input time. June 2014. I came back, wrapped up the Symantec work, submitted it to a conference, and it went through. However, I still did not have a concrete PhD problem. Most of what I did during the past 6 months went to dust. It was ok for some initial ground work, for scratching the surface, but nowhere close to a well-defined problem to solve. High-input-low-output had come true. And this hit me pretty hard. Research did not seem to be easy any more. I didn’t know where I was heading. I didn’t even know where I had to go. I had spent 2 and a half years in the program and I still did not have a problem statement. The comprehensive exam (somewhat equivalent of what is referred to as a qualifying exam in other universities) was overdue. I got an “Average” rating for the yearly review. The review read, “He is a smart student, but definitely has not picked up how to do research. He needs to really pick up some concrete questions and contribute with research work by end of the semester, otherwise, it is going to be tough to continue.” The illusion of success had been busted wide open. The first few conversations I had with PK during the second half of 2014 highlighted the problems with my PhD journey more and more. It was during one of these conversations where I was given the ultimatum. Getting my act together or leaving [literally] were the only options I was given. I stepped out of the meeting and I was in tears [which is pretty rare by the way]. I came back to the lab (which was somehow empty that time of the day) and started evaluating my options while not being able to control those salty droplets dripping out of my eyes. I was seriously contemplating the option of dropping out. “I’ll figure out something, I still have a Masters degree”, I said to myself. It took an hour of consoling from Niharika to get me back to my senses. I was shattered. This was probably the lowest point in my life. Starting 2006, I had been on top of my game. Aced undergrad, aced Masters… But as they say, “the higher you fly, the harder you fall.” Over the next few days, I told myself that I couldn’t just drop off. Overcoming this failure would probably be one of the biggest features of my life (only if I could pull it off). Failures are supposed to be part of life. Success is meaningless without failures. Basically, all those classic motivational one-liners were suddenly relevant now. The next few months were all about trying to regroup my thoughts, learning all about research [I had realised I knew jack about research], and nailing down a concrete problem. I got it down to 1) poor quality content, and 2) Facebook. I told PK that this was the intersection I would be working in. I read some literature and put together a literature review document for my comprehensive exam which took place in November 2014. Over the next few months, I worked on refining the problem and chalking out a potential thesis outline. Note: This phase of my life featured a 10-day trip to the US for presenting a paper, and a 6-week internship to DCU, Ireland [yes, again] too. With the kind of excitement I usually carry for international travels, these should’ve been the highlights of this part of the story, but as was evident, something bigger was going on during this time. Adventures from the travel, maybe some other time. Three years into the program, I had virtually nothing that would be part of my thesis. But the good part was that the worst was over. The next 16 months or so were all about constructing the castle of my thesis brick by brick. I’ve always been inclined towards “building systems” more than studying / reading about things, i.e. I prefer the “practical” over the “theoretical”. However, PhD [in most cases] is incomplete without theory. I couldn’t keep myself away from thinking about a practical solution approach when I saw a problem, and at the same time, I knew that PhD would keep itself away from me if I didn’t do well at theoretically backing up a proposed solution. I had to cater to both, and I was able to do it in the form of Facebook Inspector. I identified a problem [of poor quality content running riot on Facebook], gathered some data, used the all-mightly theory-heavy machine learning and natural language processing to solve the problem, and put out the solution in the form of a system for everyone to use. That’s pretty much what Facebook Inspector was [easier said than done, trust me]. It satisfied my appetite for “building” systems and at the same time, had the potential to bring theory to the scene. I did one project and wrote a paper, then another, and another, and went on and on. Each paper (or project I took up) was completely defined by me, unlike the kind of projects I had done during the initial phase of my journey. I learnt from every project and used the learning to improve the quality of the next project. I slowly gained my confidence back. I was getting back on my feet, but somewhere inside, I knew I wasn’t the best at what I was doing. Whatever I was doing “needed to be done” more than me “wanting to do it”. Whether I wanted to do this for a career was questionable. I had come to terms with what PhD research was, but it had taken me slightly far away from what I “really” wanted to do. Would this last forever? Would things change after some time? Would I be able to get back to doing what I want and still be good enough at research? I didn’t have the answers. Moreover, I didn’t have the time to look for answers. Building a strong thesis was top priority. It was the only priority. Meanwhile, the work I was doing [identifying poor quality content on Facebook] was getting hotter and hotter in the community. Facebook started frequenting the news; media houses held the social network responsible for the spread of one rumour or hoax after another. The relevance of my work shot up, giving me confidence to pitch my thesis as timely and important. The summer of 2016 helped me discover a new side of me. I was one of the “senior” people in the lab by now. Our group [Precog] was getting recognition. Students from other institutes in the country (and even abroad) wanted to come to us to work. This was an opportunity to “lead” a project instead of doing one. We got lots of very smart students from different parts of the country (and the world) to work with us during the summer. This is what is now famously known as the #PrecogSummer. As for me, three smart students, 3 months of summer, and a completely new area [computer vision] produced some really exciting output. I had not only gotten into a new area of work, but also into a new role; a “project leader” of sorts. And fortunately, it all worked out well. All the three students were happy and satisfied about what they had done during the summer, and so was I. More importantly from a personal perspective, getting back to doing something that was appreciated and taken well by the advisor [PK] really helped me get back my confidence and my competence. It was at this point that I started getting back to being my confident self again, without worrying too much about what would happen to my PhD. PK had shown faith in me, helped me get back on my feet, encouraged me and made me believe that I still belonged to this league. Looking back now, I realise how big a risk he took with me. An unsuccessful PhD candidate doesn’t look pretty on any professor’s profile. He took the risk anyway (and I’d like to believe he would feel it was worth it :P). The advisor showing faith and trust in you is a game-changing phenomenon during PhD life. I’ve been lucky to have experienced this phenomenon. Mind you, everything I did during this phase, had still not converted to acceptable output. I barely got enough to keep me afloat, but I needed more papers accepted at better places to have a strong enough / defendable thesis. Rejected drafts kept piling on. I kept on resubmitting to different venues. By January 2017, I had done enough work to make up [what I thought would be] an acceptable thesis. PK and I had already agreed on this. It was time to start wrapping up. More “new” work wasn’t needed, but existing work needed fixes and acceptance in the community. However, this wasn’t reason enough to stay a PhD student for long. It was time to move on, to start looking for a job, for a life after PhD. By February 2017, all of my work had either concluded, or under review somewhere. There was always scope of starting new projects, but it was time to step out into the real world. Browsing LinkedIn for jobs had become the most common thing to do these days. At the same time, I was facing an internal conflict. All my student life, I wanted to go outside India to work after finishing studies. But finding a job in Europe or the US is pretty goddamn hard for the simple reason that you’re not a local. Why would any organisation go through the pain of bringing a foreign national onboard. Not only is it complicated, but expensive and time consuming as well. A good alternative was post doctoral research (famously a.k.a. postdoc). This route was comparatively much easier. However, postdoc would have meant continuing to do academic research, something which I already confessed I wasn’t the best at, and something I wasn’t sure I really “wanted” to continue doing. The only option left was industry in India, but then I wanted to go outside! While I was going through this internal conflict, I got news that Niharika was leaving. Leaving for good. She had wrapped up her work and I knew she was looking for job opportunities. She got a pretty amazing job offer and she had to join soon. Of course I was happy for her, but this still hit me like an absolute shocker. Why? I’d like to use up the rest of this paragraph to take a bit of a detour here. Niharika and I started our journeys together way back in July 2010 as Masters students at IIITD. We did almost all our courses, assignments, and projects together during M. Tech. We joined PhD together, with the same professor, in the same lab, around the same time. We also shared our journey back home together for the first couple of years. We shared big chunks, and all the ups and downs of our PhD lives with each other. Essentially, she was one constant in my life at IIITD who was there every single day, every step of the way for the past 7 years. And when I realised that this constant wasn’t going to be there any more, it gave me a mini panic attack at multiple levels. After that, somehow, the lab didn’t feel like home any more. Every day I stepped into the lab since, something told me that I HAD to leave soon. Not only had one of my closest associates left, this was also a reminder that it was high time for me to make a move on, too. I was lagging behind. Apparently, I wasn’t taking job hunting too seriously. But now I knew I had to step this up. I started preparing for interviews and started setting up interviews with any company that would show interest. While I was coping with the shrewd job market as a fresher, my inputs over the last year or so started showing output. One paper got through a journal. Then another got through at a decent conference, and another as a book chapter. I also got an opportunity to spend 3 months as an intern at IBM Research. All this happened within a span of a couple of months or so. The IBM internship was important at two levels. One, this was perfect timing for me to “impress” IBMers to get a shot at a full time position, and two, this was my opportunity to leave the lab for good and move on in life. However hard it may sound, I knew it had to happen. It was about time. So I thought the sooner the better. April 30, 2017. My last day in the lab. A mixture of emotions amidst a goosebumpy level farewell from fellow lab mates. I was excited to have “potentially” levelled up in life, but at the same time, it isn’t easy to go away from a place where you’ve spent 7 good years of your life. Above all, this opportunity wasn’t technically a move on [that’s why I said, “potentially”]. If I couldn’t convert this internship into a full time position, or couldn’t find another job in the next 3 months, I would have no where to go. I had already told myself that coming back to the lab was not an option. This feeling really, really stressed me out. 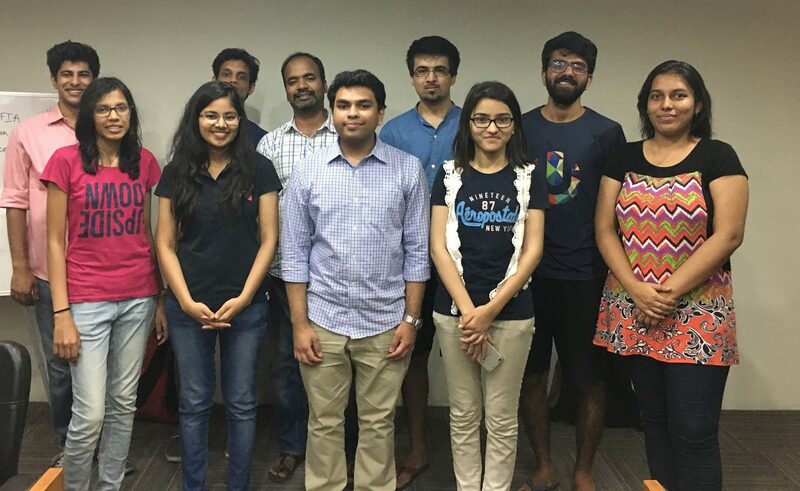 I moved to Bangalore the very next day and joined IBM as an intern on May 2, 2017. The next three months were pretty eventful. A completely new area of work, regular outings with fellow interns, and job hunting kept me pretty occupied. The month of May was particularly stressful. Consistent rejections from job interviews were eating me up from the inside. Stress levels were at an all time high. Normally, no matter what happens during the day, I usually sleep well at night. This was probably the first time in life that I started encountering sleepless nights. Was I being too harsh on myself? I don’t really know. After all, I really did not have a plan in life after July 2017! How many rejections would it take to get one acceptance? Would that “one” acceptance be the only acceptance I’d ever get? What if I don’t like that “one” and don’t get another chance either? Finding the first job on your own is one hard nut to crack! No matter what your CV or qualifications say. Among the many applications that I had put in, was an application for a Data Scientist position at Apple [that company which makes fancy, expensive phones]. A few days after I put in the application on the Apple website, I received an email from someone at Apple asking for my availability for an interview. This was kind of unbelievable. I was struggling to get through tiny startups! Moreover, the response rate that I was experiencing was no more than 2 in 10 applications [in the best case]. I looked at the email header to verify if the email was genuine. It seemed ok. I confirmed the interview which was supposed to happen later that week. Four rounds of interviews and one month later, the HR called me for a face-to-face at Apple’s Bangalore office and told me that I would be getting an offer. I had made it through. THIS was a moment for which words like “flabbergasted” are made. I did my best to control the excitement but kept this strictly to myself. I had to see the offer with my own eyes before sharing this with anyone. Another 3 weeks later, I got the offer which I accepted. Done deal. My biggest cause of stress had vanished. I finally knew what I would do, where I would go, and where I would be [hopefully for a foreseeable future] after July 2017. I shared the news with family and friends. All my near and dear ones were ecstatic. Here I was, struggling with my PhD until less than a year ago, knowing I wasn’t the best at what I was doing, barely making progress in life, and all of a sudden, I had a contract with one of the world’s best. What’s more, the profile I was offered, wasn’t academic research. It needed “practical” applications of whatever I had learnt, to address real world problems. The moment I was told what my job profile at Apple would be like, I knew this was what I wanted. Like Steve Jobs once said, “A lot of times, people don’t know what they want until you show it to them.” I can’t think of another moment in my life where this could be any more relevant. Meanwhile, one of the papers that I had gotten accepted a few months ago, had me visit Sydney, Australia for a week for the presentation. This trip had come right in between the IBM internship and joining Apple. Exactly what I needed. This was the cherry on top of the metaphorical cake. Life was sorted. Everything was in place. I couldn’t see how anything could’ve been better than how it was in the current state. PhD journey had come to an end. The real world was waiting. All’s well that ends well. Happy ending. One consistent factor throughout my journey (and probably everyone’s journey) at Precog was the people, the lab, and the culture. We were always a happy bunch of kids who worked together and partied together. There was always someone for everything. From people who’d leave behind their work without a second thought and brainstorm with you to solve your problem, to people who’d be ready in a jiffy if you ever felt like going out for a drink, we were a great mix of everything. We never let anything get to us. No matter how big the problem, we knew we’d eventually figure it out. All of us, as a group. It was towards the end that I truly realised the true value of having such a strong support system. Surviving 5 years of PhD [especially for someone like me] without such an environment at work would have easily been at least a hundred times harder. Ofcourse there’s the commander-in-chief [PK], but it is also the people that make Precog magical. People often say that PhD is not a destination, it’s a journey. What they don’t say is that it is a journey of self-discovery that humbles you to the core. This is a phase in life where you get the freedom to do what you like, fail, pick yourself up, repeat, and figure out what’s best for you. What I learnt about myself was what I did NOT want to do in life; academic research. As ironical as it may sound, this was my biggest and most important learning from PhD. I was doing academic research but it didn’t really come to me naturally. I trained to work hard, be patient, and persevere. I wasn’t a natural at any of them. Mind you, these skills are priceless to possess and I’ll always appreciate learning them no matter how hard it was. I could train myself and get better at academic research. In fact, I did to an extent. But I knew if I had to do it for long, I wouldn’t be my happiest self. If I took up academic research as a career, I would always think that there’s something else out there that I might be happier doing. So I made my choice. Academic research wasn’t for me. I had to push myself away from it, and move into something more and more hands-on, something where I could spend more time experimenting, failing, learning, improving, improvising, and innovating but without the infinite time-consuming cycles of cramming my ideas into eight (sometimes ten) page documents packed with jargon, and defending them to an unknown bunch of people through a peer review process. 1. Louis Pasteur once said [PK also said this a few times], “Fortune favours the prepared mind.” What kept me from breaking during my journey was the fact that I was always prepared. Prepared for the best and for the worst. If you’re prepared, nothing can surprise you. Eliminating the element of surprise from a situation deflates half its impact already, making it easier to deal with. 2. Harvey Spector says, “Anyone can do my job, but no one can be me.” You’ll always be replaceable. There’s nothing you can do that someone else can’t. It’s only a matter of finding the correct replacement. So be more than a machine. Bring more than your technical skills to the table. What you do has a price. Who you are, doesn’t. There’s a difference between what your value is, and what your worth is. Make yourself worthy in addition to being valuable. Because there will always be someone else who can do your job [maybe even for a better value], but you’d be preferred only if you’re worth it. I’ve been fortunate to have some extremely smart, fun, and hard working people during PhD. There are too many people to thank here and I would prefer not to specifically add names simply because of the fear that I might miss out someone, which I would hate to do. So, to everyone who has been associated with me during this journey, you know if you are one of them. I’d like to say, thank you. MT10014 and PhD1111 signing off.